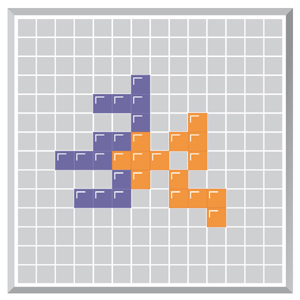 Free Printable Blokus Board. Free printable boardgames for children. 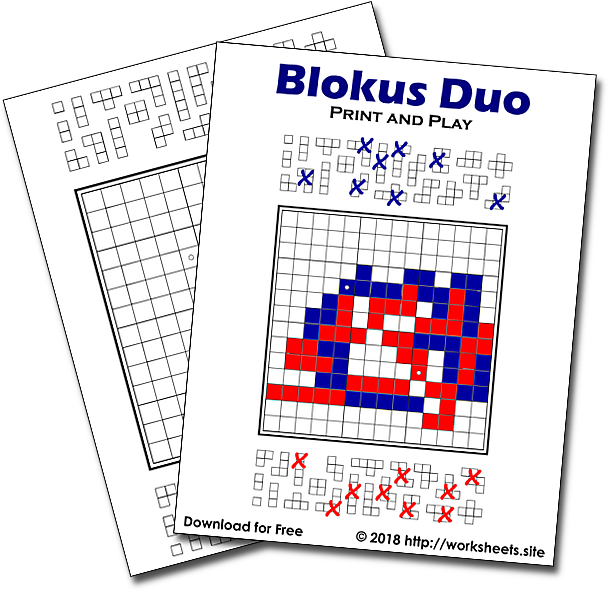 Print and Play Blokus Duo. Strategic drawing and coloring game. Travel Blokus. Pen and Paper Blokus. Download and print the Blokus boardgame. If you don't want to go through the hassle of finding and buying the board and you have a printer, simply download this 2-page PDF and print it. You'll get a neat mini game in an instant. Each player tries to put the maximum amount of their squares on the board. Each player chooses a colouring pencil. Randomly decide who goes first. During the game, players decide which of their pieces to use, scratch them off from their side, and draw them on the board. Pieces can be drawn rotated or flipped. The first piece drawn by each player must cover one of the starting places on the board (marked with a circle). Each new piece that is played must touch another played piece of the same colour on the corners of any square. No two sides can ever meet of the same colour. Different colours, however, can touch their sides and even intersect. Game pieces can be placed in any direction on the board. Once they are placed they must remain in that position for the duration of the game. When a player is blocked from being able to make a move, the game ends for them. 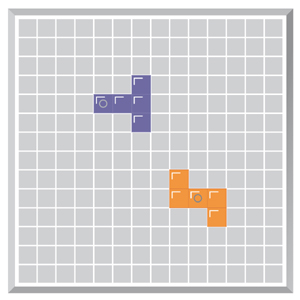 When both players are blocked from making moves, they count the number of individual squares they have left in their reserve (each piece is composed of several squares). The player who has the least amount of squares remaining is the winner. If a player managed to use up all their pieces, they are the winner unless another player managed to use all of their pieces, as well as using their single square piece as the last piece placed on the board.